Clean the mussels: fill a large bowl about half way with cool water, add the flour mix and then add the mussels. Let them soak for about 30 minutes to remove any sand or grit. As you pull the mussels out of the water make sure they don't have a "beard" (looks like a big piece of gross coming out of them) if they do pull it off and discard, also discard any mussels that aren't tightly shut at this point, and then give the good ones a quick rinse. In a large pot heat the butter and olive oil over medium high heat add the onion and tomato and cook until tender, about five minutes, and then the garlic until fragrant, about 2 minutes. Add the parsley, thyme, and wine and bring to boil. Once boiling add the mussels, give them a good stir, cover the pot, reduce the heat to medium and cook until the mussels open - about 8 minutes. Shake the pan once or twice during cooking to ensure the ones on the bottom don't burn - but don't take off that lid! After cooking, discard any mussels that didn't open, they are bad, then drizzle the cream over the top of the hot shellfish. 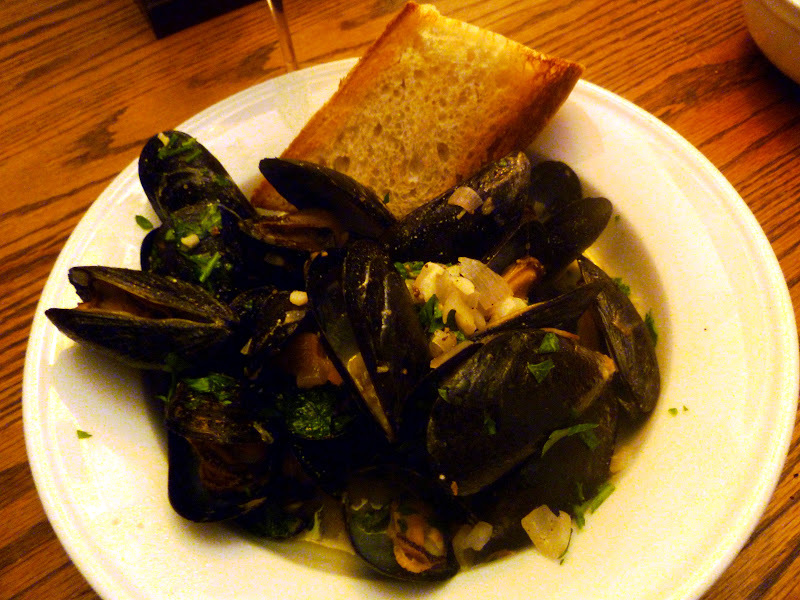 Use a large spoon to scoop mussels and sauce into bowls and serve with crusty toasted bread! i’m not sure i would ever attempt mussels at home-scared they will smell up the house :) they look so good though! That looks delicious! I am a sucker for seafood! In any way, shape, or form!